I decided to come to Tokyo to this residency program because I was very interested in have more contact with Japanese culture. Due to my origins, the silence in japanese society has always interested me, and whe I fisrt came to Tokyo in 2008, I was really impressed with the contrast between the noisy and crowd urban ambients and the silent and spacious shrines and temples. This sensation led me to start researching the japanese concept of “Ma” in relation to sound and space, and this research gave the basis to create this project I am developing right now. I am planning to make several field recordings in different places and situations in Tokyo, focusing in moments of silence and contemplative sensation. I am considering the contrast of sound ambiences, spatial sensation and memories and images that the recordings could inspire. The most important thing about this task is ambient awareness, and for this reason my working methods are based in observation and exploratory bike riding. As bike riding provides a direct contact with the urban ambient and it is a faster way of moving, it allows me to cover large areas. It also provides a very good way to observe the situations and places with a certain distance before start recording, and to capture some sounds in movement. There are some situations that require some strategy to be recorded. (I already used this kind of procedure during my residency in Paris, in 2012. At the time, I was recording neighborhoods which concentrates immigrants from determined cultures, which required me description and ingenious strategies of sound recording). All the sounds recorded will be then organized for editing and mixing. This part of the work is very arduous, and normally take most of the time in studio. As I am not sure if all the sound sculptures for the installation will be concluded, I am planning to present part of the results in the Open Studio in february. Sound art installation that deals with silence in japanese culture through a poetic spatial occupation with sound. The sound sculptures are composed by field recordings which are conceived as a result of a aesthetic and cultural research in Pachinko houses, Temples and Shrines in cities like Nagano, Matsumoto, Kyoto, Nara, Koyasan and Tokyo. Born in 1979 Graduated in Communicantion and Multimidia in 2005. Master Degree in Cognitive Sciences in 2014. Dudu Tsuda: multimidia artist, sound artist, musician, composer, guest professor at Catholic University of São Paulo. He has a bachelor’s degree in Communications and Multimedia at Catholic University of São Paulo in 2005, and concluded the course with the monograph tittled Contemporary Music for the Scene. He has degree in Semiotics and Aesthetics at Catholic University of São Paulo with the monograph tittled Sound Art and Space: New Aesthetic Possibilities in 2014. He has studied Social Sciences at University of São Paulo until the third year and International Relations at Catholic University of São Paulo until the second year during the period of 1997 – 2000. 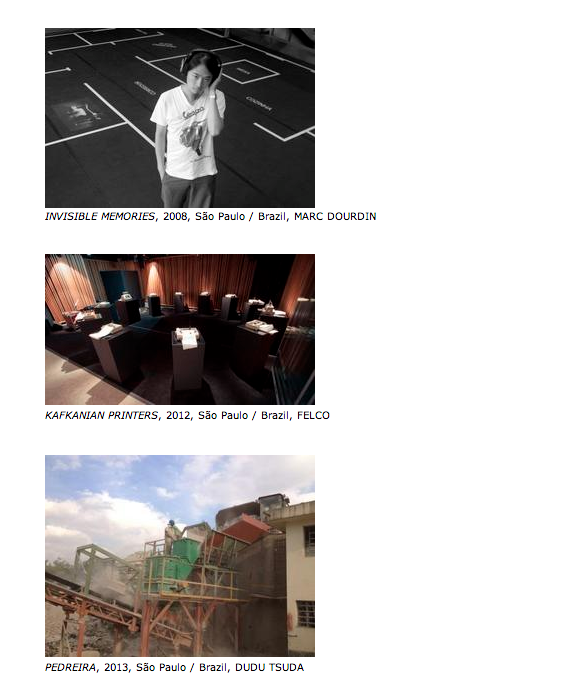 He has been nominated to the Sergio Motta Institute Award 2009 (http://www.ism.org.br/). Laureate at the Institut Français / Ville de Paris Résidences aux Récollets Artistic Residency Program 2012 (Paris / France). 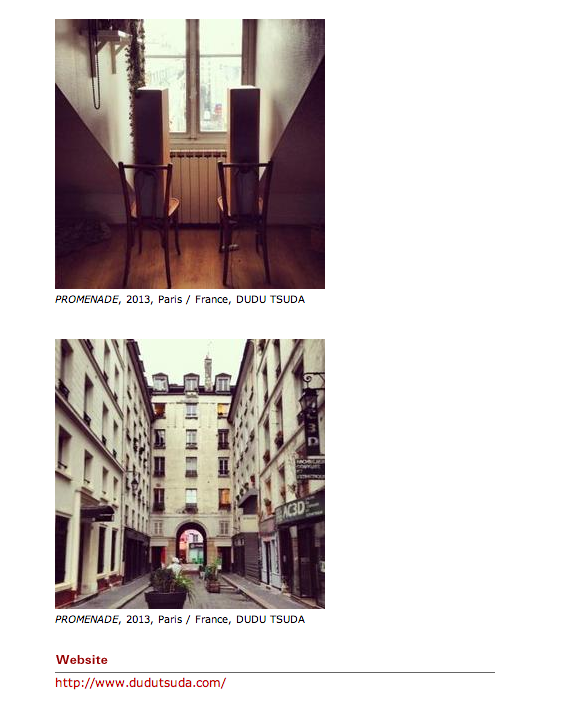 Laureate at the Cité Internationale des Arts de Paris Artistic Residency Program 2013 (Paris / France). 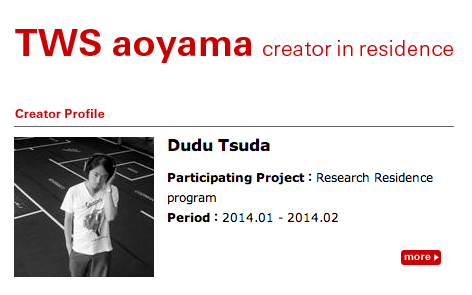 Laureate at Tokyo Wonder Artistic Residency Program 2013 (Tokyo / Japan). Laureate at CAMAC Centre d’art – Marnay Art Centre (Marnay sur Seine / France 2014). He realizes interactive audio and video instalations Memórias Invisíveis / Invisible Memories- at the International Symposium and Exposition F.A.q. 2 Sesc Ipiranga – curators: Lali Krotoszynski, Mario Ramiro, Sérgio Basbawn / participation of Roy Ascott – Planetary Collegium (http://bitly.com/YSolF) – São Paulo/Brazil 2008, Symphony for Open Spaces – at the 8th Serrinha Art Festival- Bragança Paulista/Brazil 2009 and at the Individual Exhibition Espaço Aberto_Linguagens do Artista SESC Ipiranga – São Paulo/Brazil 2010 (http://bit.ly/fCgeB1), Volume at the Collective Exhibition 2+6 at Galeria do Meio / Art Gallery São Paulo/Brazil 2010 (http://bit.ly/x7chQm) and Kafkanian Printers – Mostra SESC de Artes 2012 São Paulo/Brazil (http://bit.ly/P11Qb1), Stone Quarry – Sistemas Ecos – São Paulo/Brazil 2013, Promenade – Virada Cultural de São Paulo – São Paulo/Brazil 2013 and “Si ma rue était…” Public Space Exhibition Paris/France 2013. He realises concerts with his song project in (Virada Cultural of São Paulo/2010, Mostra Melhores Prata da Casa Festival of 2010 – SESC Pompéia/2011, Prata da Casa SESC Pompéia/2010, 3rd. Internacional Congress of Cultural Jornalism SESC Vila Mariana/2011), the audiovisual performances with the group Telemusik (http://bit.ly/Tf27ZB) (7a Bienal of Mercosul, II Internacional Live Cinema Exhibition /2009, ArteMov Exhibition Porto Alegre/2010, Kinolounge Exhibition MIS/2010 e 40o anniversary of Paço das Artes of São Paulo/ São Paulo – Brazil 2010, Continuum Exhibition/Recbeat Recife – Brazil 2012), and the audiovisual performance Le Temps Suspendu (Cité Internationale de Arts de Paris – Paris/France 2013, Sistema Ecos Exhibition – Praça Vitor Civita / São Paulo – Brazil 2013, Exposição individual Sonora Paço: Espaços Urbanos – Paço das Artes de São Paulo / São Paulo – Brazil 2013 and SESC Ipiranga / São Paulo – Brazil 2013). He integrates the Contemporary Dance Company Núcleo Artérias (Award wining of APCA 2006 e 2008, Rumos Dança 2006, Caixa Cultural 2007 / dir. Adriana Grechi) and the pop music group Jumbo Elektro. He realises original sound tracks for dance spetacles, instalations, videoart and cinema, in institutions like Itaú Cultural, Bienal of São Paulo, Espaço Oca, SESC São Paulo, SESI São Paulo, Fundação TV Cultura and British Council.